Trade show banners are required by any company going to industry events. At Canvas, ETC, we’re able to print high quality graphics onto fabric so that you can advertise your brand at your next event. Well-designed trade show banners attract leads and more! Learn how you can use custom fabric printing and trade show banners to transform how you do business. Do you know who attends trade shows? It’s the decision makers. That’s right. The person your sales and marketing team most need face time with come to industry events. Therefore, when creating a custom exhibit for your next event, it’s crucial that you design one that will attract and delight your prospective customers. Sure, you can rent some displays, but there may be a few issues with that. First, rental displays don’t do a good job conveying your brand’s story. That’s a problem if you’re looking to stick in the minds of prospects. Second, if you find yourself registering as an exhibitor in the last minute, you’ll find that rentals may not be available to you. Lastly, although you don’t’ have to pay maintenance costs and storage fees, rentals are not cost effective if you’re visiting more than two trade shows per year. As tired as you may feel over the span of a long show, participants feel the same way. We suggest making your booth feel welcoming by creating a lounge space that natural attracts tired attendees looking to put their feet up. If you give an attendee a chance to take a seat, they’re more likely to take in a greater amount of your pitch or demo since they’re happy to relax. The result? They’ll leave with a positive impression of your image. Numerous vendors arrange for power for at their booths to power televisions and laptops. Be that as it may, some forget to use their power to its fullest by ensuring they have appropriate lighting for their space. Shining light on particular signage or a key segment of your showcase can have clients approaching you rather than your competitors. Recognizing what sorts of lighting are available and how to utilize them ideally will really make your booth special. You can talk to the exports and Canvas ETC to learn about your lighting option. You can do all these things and more with trade show banners and booths from Canvas ETC. Many organizations consistently utilize trade shows to help improve brand awareness, roll-out new products or services and gain information about their competitors. Furthermore, conventions are a magnificent way to make industry connections and offer limited time offerings to attendees that will assist them with remembering the name of your brand. If you’ve never been at a trade show, you’re missing one of the most influential marketing efforts your company can participate in. Understand that your decision of expo displays is imperative when arranging your public expo participation. Trade shows are a brilliant place to present your brand image and make industry contacts. Be that as it may, if your show is boring, you may just blur into the background. So, it is critical that you pick a display that will feature your image and encourage guests to visit your exhibit. The purpose of a public expo show is to attract passersby and catch their eye with your advertising messages. Without an intriguing presentation, you just won’t get the guests to your stall that you need to get ROI for your trade show. 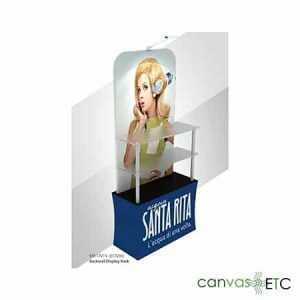 Canvas ETC can assist you with planning your expo booth and trade show banners to guarantee that you get the prospects or clients that you need. Choose Your Graphics Carefully: Straightforward, striking and clear images are the best in making a memorable impression. Overly-complex included, puzzling and confounding workmanship and designs might be awesome to take a gander at however can be and substantially confusing artwork may look cool, but are distracting at best. If you are in the market for custom trade show banner designs, there are numerous websites that offer straightforward image searches and affordable photographs that might be utilized when you’re designing your trade show banners. Make Your Brand Name BIG: Now’s not the time for modesty. Feature your brand name prominently to leave no doubt in the mind of the attendee as to who you are. You pay lots of money to get an exhibit space, so make sure your visibility is good. If you don’t have a company logo, now’s the time to have one professionally made. Let Them Know How to Reach You: On your trade show banners, be sure to have your company contact info clearly visible. No, we’re not talking your full mailing address. We’re talking phone number, social media profiles and website. If you don’t have a website or social media profiles, now’s the time to invest. Starting a social profile costs you nothing and it only needs occasional updating. Your digital presence is just as important as your real presence. Make a Tagline an Attendee Won’t Soon Forget! : Headlines, or taglines, should be short, concise and clear. Tell people what you do and why they should work with you. What’s in it for them? If you print your tagline on your trade show banner, choose a font that is easy to read. There are thousands of typefaces, but make sure you can read them well up close as well as from afar. You want to make sure your brand message is understood. Our large selection of trade show banners includes retractable banners, outdoor flags, hanging banners, and others. Trade show banners offer an awesome method to stand out enough to be noticed at events and special occasions. Since these occasions for the most part include travel, our trade show banners are intended to be lightweight, versatile and simple to assemble. Lightweight banners mean minimal hassle during transportation, yet furnish you with the space to show designs, logos, and other graphics. Therefore, they can be put anyplace you’d like and require next to no floor space. Set up expo flag stands, otherwise called banner displays, at the passageway of a display corner to allure individuals to ask about your business. Flag displays are additionally useful for retail situations, sports settings, show halls, and that’s only the tip of the iceberg. We offer the greater part of our public exhibition stands with custom printed illustrations for a major visual effect. Use these convenient displays, exhibit stands and other expo flag. Encourage brand recognition and establish a long-term connection on your clients. Start designing your custom trade show banners today with Canvas ETC. Lastly, our team of dedicated fabric printing experts will guide you through the entire process. Contact us today to learn more.